That was funny man. All you barista, maybe if your extraction only comes out from one side, you get extra marks. 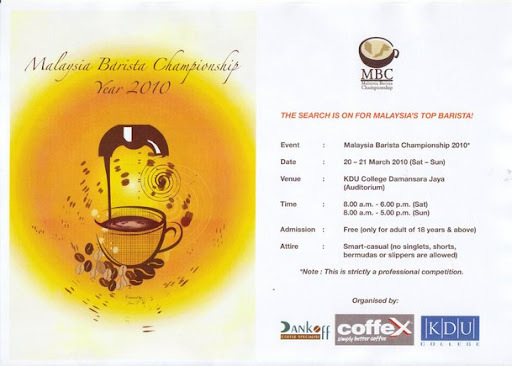 I urge those who have not seen a Barista Competition before to go and experience it. One of the debate surrounding Barista Competition, including the World Barista Championship is that these are events that preaches to the converted. Though the intent is to promote coffee and the profession as a barista, the audience (or public who are not part of the industry) generally does not really find it interesting. The audience don’t get to taste any good coffee at the event. It’s all SEE and NO TASTE kinda event. I wonder when they are ever gonna make changes and let the general public experience good coffee especially good espresso and cappuccino made by good barista. There are some ridiculous rules too which I will comment only after the event. But still, this year there will be some good competitors and the standards will expect to be higher. I will surely be there.